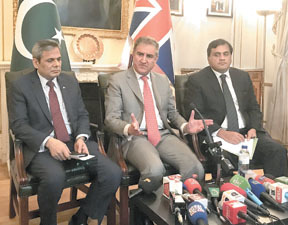 LONDON: Pakistan’s Foreign Minister Makhdoom Shah Mahmood Qureshi has said that London events proved very helpful in boosting Kashmir issue at the international forums and this practice will continue in future. After three events apart from two demonstrations in London, the next phase would be in Brussels this month where a public hearing would be conducted on Kashmir issue. Addressing a press conference here at Pakistan High Commission, he said that Pakistan will hold more events on Kashmir in the United Kingdom this year after the success of ‘Kashmir Solidarity Day’ and related gatherings, officials said. “UK had a logical responsibility towards the Kashmir issue since it ruled the sub-continent for around a century. We are planning to keep up the momentum. There will be regular events in UK. 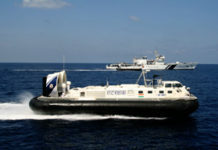 This will also attract world attention and also remind the UK of its expected role,” he said. He said India’s consistent denial of this right recognized by the United Nations Security Council resolutions was a telling example of impunity. “The human rights violations in Indian occupied Jammu and Kashmir are a blot on the conscience of humanity and demand immediate corrective action by the international community,” he added. The minister said the Reports of the Office of the High Commissioner for Human Rights on Jammu and Kashmir and the UK’s All Parties Parliamentary Kashmir Group have lifted the veil off decades of obfuscation by India of massive human rights violations and unspeakable crimes against humanity in occupied Kashmir. “Pakistan remains committed to finding a just and peaceful resolution to this long standing dispute. Our principled position on the Jammu and Kashmir dispute is based on none other than the United Nations Security Council resolutions. These resolutions provide for the final disposition of Jammu and Kashmir dispute through a free and impartial plebiscite under the auspices of the United Nations,” he said. 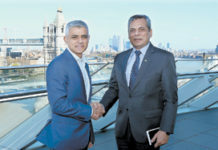 Spokesman for Pakistan’s High Commissioner Mohammad Nafees Zakaria and Spokesman for Foreign Office Dr. Faisal Mahmood were also present at the press briefing.